Why it's daunting: As with new romantic and new jack swing, there’s something lamely anachronistic about any musical genre that calls itself “new” yet no longer is. However, the New Wave Of British Heavy Metal (abbreviated as NWOBHM; just don’t try to pronounce that acronym phonetically unless you want to sound like a dumbass) has aged incredibly well since its heyday in the late ’70s and early ’80s. Chalk it up to underexposure. While a handful of NWOBHM bands, most notably Iron Maiden and Def Leppard, bled into the mainstream to varying degrees, the genre as a whole has been consigned to relative geekdom. Ironically, it’s thrash—the far fiercer movement that was directly influenced by NWOBHM—that wound up having more commercial appeal and staying power. But that underexposure also means a lot of people have never heard many of the key NWOBHM releases. Even as a blurred snapshot of metal’s adolescence, NWOBHM is essential. Before NWOBHM, metal retained many vestiges of hippie culture. Black Sabbath wore bellbottoms; Judas Priest covered Joan Baez. (Both bands, as well as many other metal elders, would become reenergized in the wake of NWOBHM.) Inspired by punk’s savagery and DIY ethic—yet rejecting punk’s disdain for musicianship and imagination—NWOBHM forged badass, streetwise anthems that honored metal’s traditions while groping hungrily for the future. Despite the fact that the genre produced some timeless classics, it takes a bit of context to fully appreciate NWOBHM, especially since so many of its attitudes and innovations became clichés in the hands of those who followed. Another drawback, of course, is that ridiculous name; as clunky as it is, though, NOWBHM reflects the ambition, desperation, and gloriously overblown sense of destiny that it injected into metal—and rock as a whole. 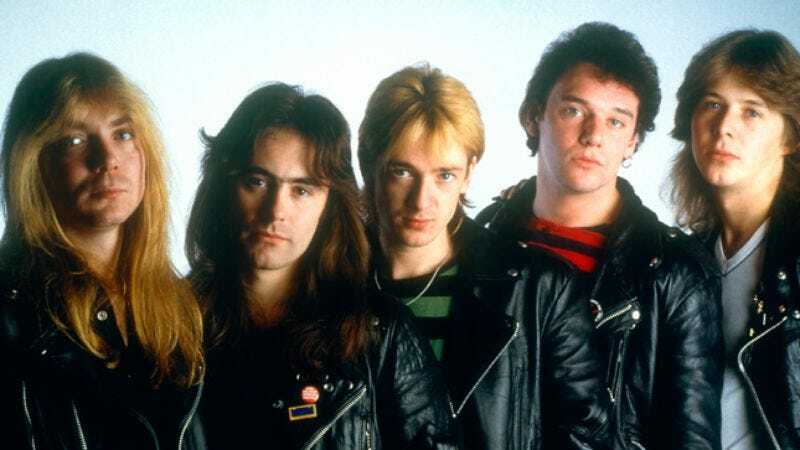 Why: When Iron Maiden’s self-titled debut was unleashed in 1980, it was clear the group—a veteran compared to many other NWOBHM upstarts—was already a step ahead of most of its peers. But it was Iron Maiden’s follow-up, 1981’s Killers, that cemented Maiden’s godhood. Led by the bestial, ballsy vocals of frontman Paul Di’Anno—Killers would be the last album he’d record with the band before being replaced by the far more operatic Bruce Dickinson—the disc is heavier, tighter, denser, and more dynamic than Iron Maiden. Not to mention catchier. Mastermind bassist Steve Harris comes into his own on blazing tracks like “Wrathchild” and the epic ballad “Prodigal Son,” the latter offering a hint of Maiden’s progressive tendencies to come. But there’s still a punk edge to songs such as “Another Life,” whose brief, spiky breakdown could have belonged to The Exploited. Killers isn’t Iron Maiden’s best album, but it’s the one that most solidly, accessibly captures the sound and potential of NWOBHM. Next steps: Best known today as “one of those bands Metallica used to cover a lot (and maybe should start listening to again),” Diamond Head has become rightly renowned for its sheer, thunderous awesomeness—that is, before it softened and went progressive soon after the NOWBHM boom, which alienated old fans while failing to gain the band new ones. But its 1980 debut album, Lightning To The Nations, is a brutally concentrated encapsulation of the merciless vision, surgical riffage, and blistering production that made NWOBHM such a well-needed smack upside the skull. Where Diamond Head was sharp and controlled, Saxon was as blunt as a boot to the crotch. Like a burly gang of Hell’s Angels that wandered into the party, the group hit its stride with a pair of gruff, grease-soaked albums in 1980, Wheels Of Steel and Strong Arm Of The Law. But in 1981, the band’s blunt yet deceptively tuneful anthems clotted into an even denser mass on Denim And Leather. An album that openly, unabashedly celebrates NWOBHM itself, Denim And Leather is far from the genre’s most technical or conceptual. But as rallying cries go, it can’t be beat. On the other end of the NWOBHM spectrum from Diamond Head and Saxon is the tuneful, glam-leaning Def Leppard. 1981’s High ’N’ Dry is the better of Def Leppard’s two pre-Pyromania albums, but that disc was already edging toward the (admittedly great) pop-metal of the band’s oncoming commercial peak. It’s Def Leppard’s 1980 debut album, On Through The Night, that falls more solidly within the NOWBHM canon. It also rules. Case in point: the vicious, fist-pumping lament about getting wasted, “Wasted.” In light of the substance-fueled death and disfigurement Def Leppard suffered after attaining superstardom, it’s even a little poignant. Metallica—or more precisely Lars Ulrich—helped popularize NWOBHM in another way: In 1990, he and British music writer Geoff Barton compiled the album New Wave Of British Heavy Metal ’79 Revisited. Much in the way that his fellow journalist, Garry Bushell, named and codified the punk subgenre of Oi!, Barton coined the term New Wave Of British Heavy Metal in 1979. Between the two of them, Ulrich and Barton put together a fantastic compilation; in addition to including most of the abovementioned heavy-hitters, it features many excellent songs by lesser-known but equally pivotal outfits like Savage, Raven, Blitzkrieg, Tygers Of Pan Tang, and the infamous group of female Motörhead understudies, Girlschool. Where not to start: New Wave of British Heavy Metal ’79 Revisited wasn’t the first NWOBHM compilation, but it benefits from hindsight. The two volumes of Metal For Muthas documented the movement while it was still in its prime; that said, the discs are rife with glaring omissions and include a lot of clunkers. Granted, part of what made NWOBHM so vital and vibrant was the collision of tradition and innovation—but groups like Toad The Wet Sprocket (no relation to the American alt-rock act of the ’90s) are indicative of the leftover blues-boogie and prog dregs that NWOBHM harbored in its fringes. Seeing as how NWOBHM did have such a nebulous definition, even during its own time, many mediocre bands have been lumped under its umbrella. Many great bands have been lumped in, too—for instance, Motörhead. But Motörhead predates NWOBHM by quite a few years, not to mention the fact that Lemmy had been playing professionally since the mid-’60s. In any case, Motörhead’s monstrous biker-rock is its own entity entirely, and it isn’t a telling representation of what NWOBHM was all about. Similarly, groups such as Venom and Witchfinder General are often wrongly stuck in the NWOBHM pigeonhole. They were both part of the scene, and they’re both essential—but they’re also iconic in and of themselves, having helped launch black metal and doom metal, respectively.